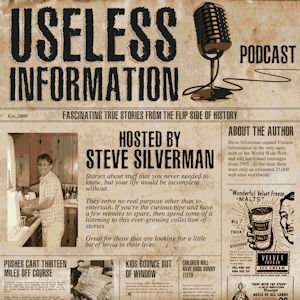 Sulfanilamide was considered a miracle drug when it was introduced in the mid-1930’s. The S.E. Massengill Co. was the first to introduce sulfanilamide in a liquid form, but in their race to get it to market they never bothered to test the safety of the drug. Within a few weeks, the AMA was notified of the deaths of six children within a ten day period, all of whom had consumed the elixir. The FDA was contacted, but was basically powerless to do anything about it. If you were to drive along the southern end of Fifth Avenue in Troy, NY, you would be hard pressed to miss a very unusual building that is located there. Imagine a circular brick building with a 110-foot (34-meter) footprint and stands nearly 50-feet (15-meters) tall. It is topped by a low-profile dome with a small cupola at its center. The entire structure is surrounded by two levels of very tall, narrow double-hung windows, many of which have been either bricked or boarded-up. For many years, this building was quite a puzzlement to me. It seemed something like a small castle, but it was immediately clear that this was not its intended purpose, particularly because the area was once heavily industrialized. I later learned that the reason I had no clue as to its purpose was that it was one of just ten gas holder buildings remaining within the United States. 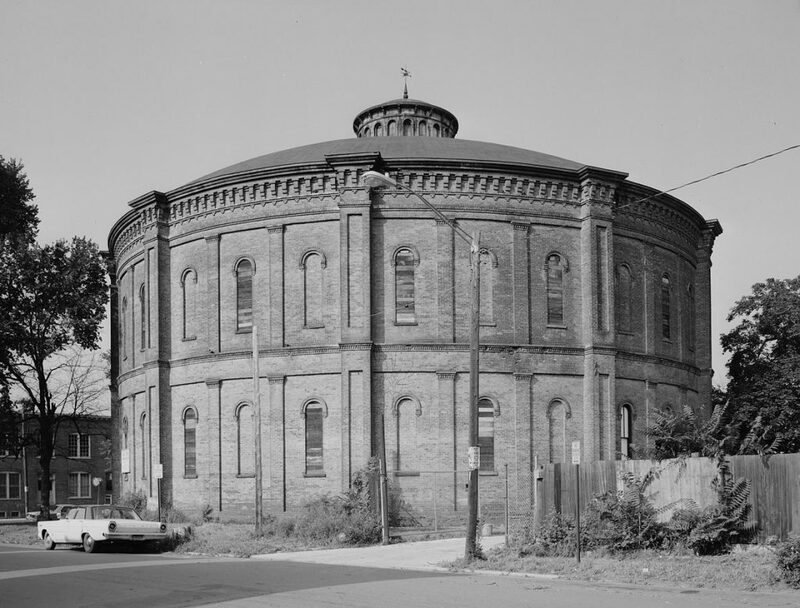 The Troy Gas Holder Building was constructed in 1873 for the storage of just what its name implies – gas. Not just any gas, but gas derived from coal. In the days before the lightbulb and electrification, gas was used to illuminate the streets of the city and the homes of the elite. Yet, to say that this building was a tank that stored coal gas would be incorrect. It would be more accurate to say that this is the building that surrounded and protected the internal storage tank from the elements. Made of cast iron, the tank consisted of two telescoping 22-foot (5.7-meter) cylindrical sections. As the gas was produced and pumped into the gas holder, the roof of the tank would slowly rise. The weight of the roof itself would provide the pressure needed to distribute the gas to the city of Troy. The tank is long gone, having been dismantled for scrap in the 1920’s, and only the outer brick surround remains. One of the by-products of the production of coal gas is coal tar. While tar has been around for millions of years, tar derived from coal was not discovered until around 1665. It’s first practical uses were most likely for waterproofing of roofs and boats, but in the early 1800’s it began to be used for medical purposes. 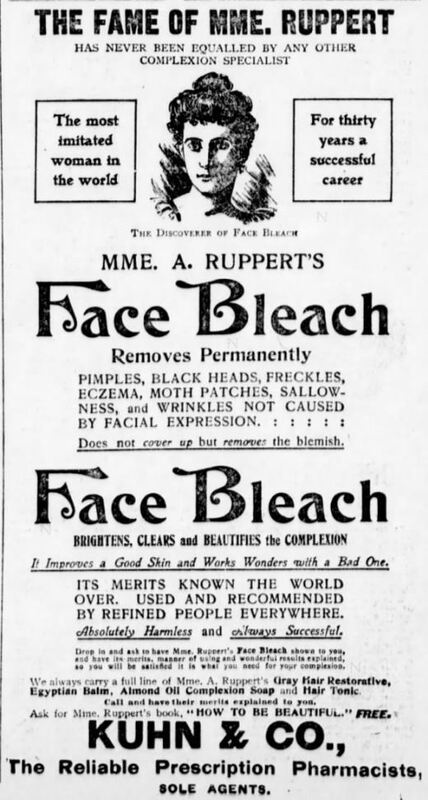 Many of those treatments were eventually proven to be ineffective or toxic, but today we still use coal tar in shampoos and soaps to treat dandruff and psoriasis. Up until this point, similar natural purple dyes were easily bleached out by the sun – think of a faded old flag – and were very costly to produce. Perkin’s new aniline dye was far more resistant to fading – his original silk-dyed samples are just as bright today as they were the day they were produced – and much cheaper to make. 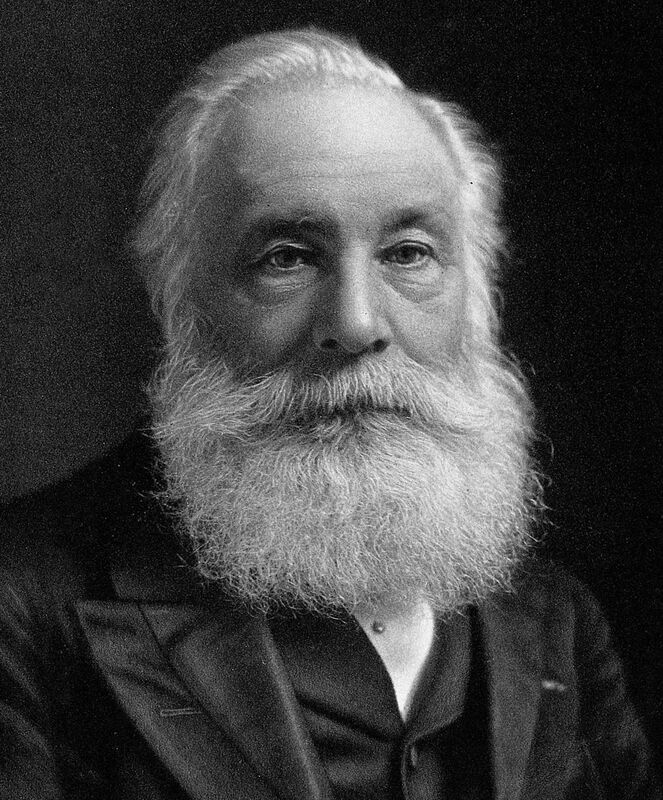 Perkin was awarded a patent for his discovery in August 1856 and opened his first dyeworks the following year. In 1859, he changed the name from aniline purple to mauveine, derived from “mauve”, the French word for the purple mallow flower. A piece of silk that was dyed by William Henry Perkin in 1860. Notice how bright the mauve color still is. It wasn’t long before other synthetic dyes were developed and factories started popping up everywhere. In 1863, Friedrich Bayer joined up with fellow dyer Johann Friedrich Weskott to form the company that we currently know as Bayer. It may be a pharmaceutical powerhouse today, but dyes were their business at the beginning. With the cost of dyes quickly plummeting, it was clear to Bayer and a number of other larger dye manufacturers that there was little room for growth or profit in such a cutthroat industry. They instinctively knew that they needed to turn their corporate attention elsewhere, but the question was where? The answer to this question would appear in 1878 when Paul Erlich, working at the Berlin Medical Clinic, began using the coal tar dyes to selectively stain bacteria. He theorized that it may be possible to use these dyes to selectively target a particular pathogen without harming the host. In other words, by finding just the right dye chemistry, it may be possible to kill a particular bacteria but not kill you at the same time. It was Paul Erlich's theory that with the correct dye, a bacteria could be killed without harming the host. It wasn’t long after this that Bayer entered the pharmaceutical industry in 1882 by introducing its with its first drug, Phenacetin, which was derived from a synthetic dye by-product. 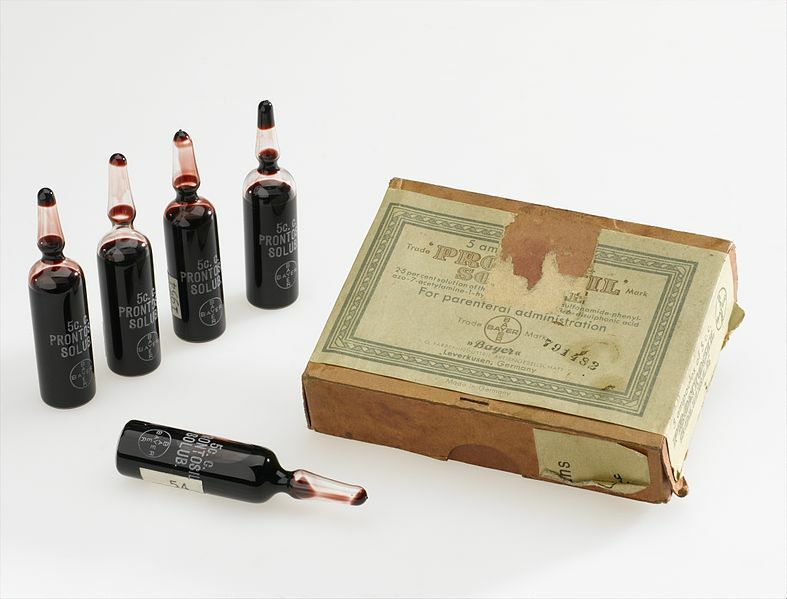 By the turn of the twentieth century, it was common procedure for Bayer to test all of its chemical dyes for possible medical uses. 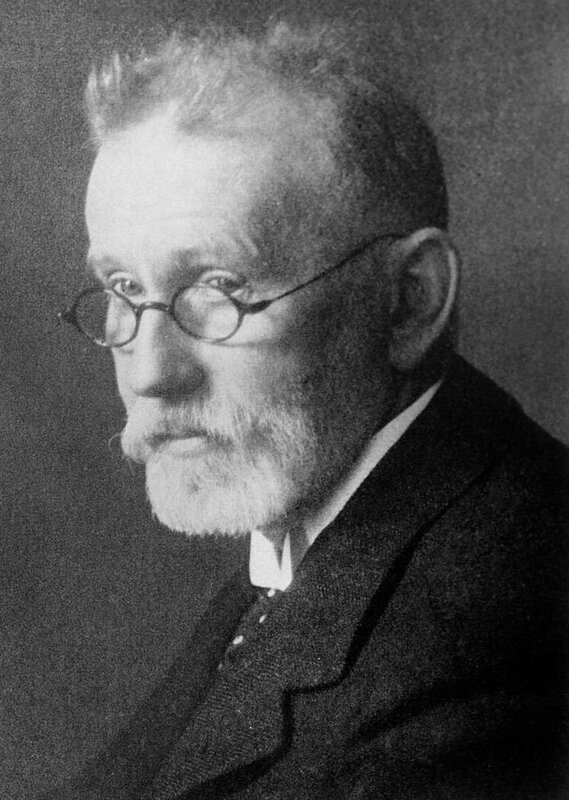 In 1932, Bayer researcher Gerhard Domagk discovered that one of their deep red dyes prevented the growth of streptococcus bacteria in petri dishes and, even more promising, cured mice infected with strep. Up until this point in history, there was no known treatment for strep, which was deadly to those wounded in times of war. Realizing the incredible potential for the world’s first antibiotic, Bayer gave it the name Prontosil and immediately applied for patent protection. While Prontosil worked – its first life was saved in 1933 – Bayer had no clue as to how it worked and refused to provide outside researchers with samples to seek an explanation. Scientists at the Pasteur Institute in Paris opted to take advantage of an 1844 French law that forbid that patenting of pharmaceuticals and opted to synthesize the Prontosil themselves. They soon discovered that Prontosil itself was not providing the cure. Instead, it was metabolized in the body into a simpler compound – sulfanilamide – which provided the curative power. Bayer’s dream of making a vast fortune from the sale of Prontosil was quickly squashed when it was learned that sulfanilamide had been previously discovered and that its patent had expired. Any company was free to produce sulfanilamide without having to pay a single dime to Bayer. Soon the market was flooded with competing sulfanilamide drugs. 5 cc vials of Bayer Prontosil. It's active ingredient was discovered to be sulfanilamide. One of the many manufacturers of this miracle drug was the S.E. Massengill Co. of Bristol, Tennessee. While not a powerhouse in the pharmaceutical industry in the 1930’s, they did claim to be the largest drug manufacturer in the southern United States with more than 500 employees. Massengill marketed the product in two forms: a capsule containing the sulfanilamide powder and a compressed tablet. In June 1937, word started to filter back from the firm’s salesmen that there was demand for a liquid form. Tablets and capsules were fine for adults, but it was far easier to administer a liquid medication to children. This finalized formula was then forwarded to Massengill’s Kansas City facility for production on August 28, 1937 and shipments of the first commercial batch began on September 4th. The total time from initial formulation to shipment out to distributors was less than 8 weeks. Massengill was certain that they had a blockbuster product on their hands. Just like today, Massengill salesmen began to provide doctors with sample bottles to give their patients. One pint bottle of Massengill's Elixir Sulfanilamide. It was smooth sailing for Massengill until Saturday October 9, 1937 when an urgent telegram was delivered to the offices of the American Medical Association (AMA). In it, a group of Tulsa, Oklahoma doctors expressed their great concern over the recent death of six children. All had died from strep throat within the previous ten days exhibiting very similar symptoms: all had lower-than-normal temperatures, respiration had slowed, and then their bodies stopped producing urine before succumbing to whatever had killed them. All six of these children had one thing in common: they had all been prescribed Massengill’s new Elixir Sulfanilamide. By the next day, the Tulsa death toll had risen to ten, which included two men who had prescribed the liquid sulfanilamide to treat gonorrhea. At this point, no one was sure as to what was really going on. Initial observations seemed to point toward possible mercury poisoning, but it could have been the sulfanilamide, the Massengill elixir, the interaction of the elixir with other drugs, or simply coincidence. Chemist at the O.M.A. Laboratories examining the Elixir Sulfanilamide to determine the cause of all of the deaths. From the October 27, 1937 issue of the Chillicothe Constitution-Tribune. On Monday the AMA wired Massengill to find out just what they had used to concoct their elixir. Massengill’s response must have sent shivers down the spines of the experts at the AMA. While not widely known at the time, research had recently been published that the solvent used to formulate the elixir – the 60 gallons of diethylene glycol – had been found to not only to cause significant kidney damage, but could possibly be fatal to anyone who ingested it. There was no known antidote or treatment for diethylene glycol poisoning and consuming as little as 1-ounce could prove fatal. Today it is used as a component in dyes, lubricants, brake fluid, wallpaper stripper, and much more. In the past it has also been used as an ingredient in antifreeze. On Thursday the federal Food and Drug Administration (FDA) was alerted to the potential problem, but were powerless to do anything about it. That is because the Food and Drugs Act of 1906, which regulated the manufacturing of pharmaceuticals in the United States at the time, did not require manufacturers to test medicines for safety prior to placing them on the market. Prior to releasing the product to the public, Massengill had tested the elixir for appearance, taste, and fragrance, but never bothered to evaluate its effect on living things. The FDA had no choice but to use the seemingly trivial reason of product mislabeling to seize the product. First, the product was misbranded as Elixir Sulfanilamide. Elixirs, at the time, were understood to contain alcohol as a solvent, but the Massengill product had none. Second, the label indicated that the bottles contained “Quality Pharmaceuticals,” which they clearly did not. And, lastly, Massengill listed their address as Bristol, Tennessee, but the product had been produced in Kansas City. S.E. 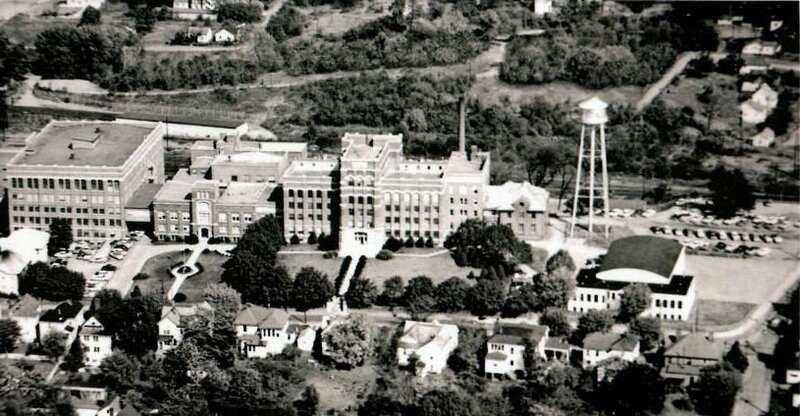 Massengill Co. manufacturing facility in Bristol, TN. Just as we would expect as a response from most companies today, Massengill initially denied that their product could be the cause of the deaths. Yet, the company opted to cooperate with the government and help get all of the elixir back. In the short time that the product had been on the market it had been shipped to thirty-one states and Puerto Rico. In 1937 a large portion of the southern United States still lacked electrification and many people still did not own radios. The only real way to grab the attention of a large populace was via newspapers, but many of them initially buried the story deep within their pages. The FDA dispatched nearly their entire staff of 239 field inspectors and chemists out to hunt down every last ounce of the elixir. This was far easier said than done. While we think of prescriptions today as being quite controlled and well documented, this was far from the case in 1937. One pharmacy record simply recorded “Betty Jean 9 months old” and nothing more. It was also suspected that some had used fictitious names to avoid the social consequences of having gonorrhea. FDA agents did their best detective work as the traveled up and down the back roads of the southern United States in search of the liquid sulfanilamide. While the hunt was on, the death toll continued to rise. On Friday October 22nd the press reported that a total of 22 people had died from the elixir. Mt. Olive, Mississippi doctor Archie Calhoun was so distraught by the news that he drove to the home of every patient that he had prescribed the medicine to. Six of his patients succumbed to the poisonous medicine. 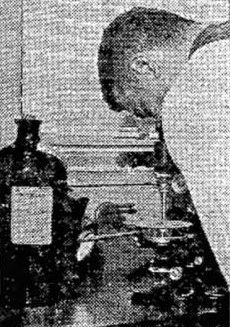 Image of Dr. Archie Calhoun examining a bottle of the Elixir Sulfanilamide, Six of his patients died as a result. 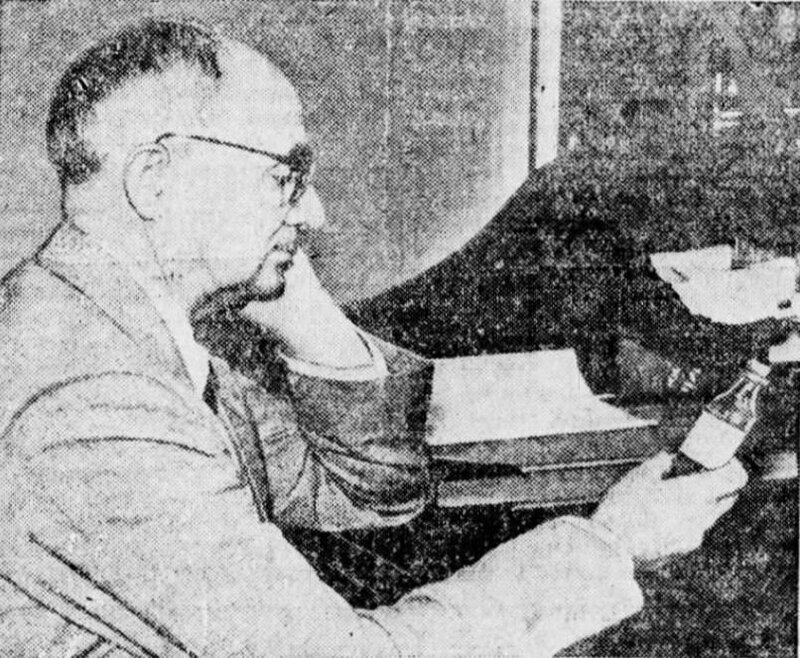 From the November 2, 1937 issue of the Danville Morning News. Dr. Calhoun wrote: Nobody but Almighty God and I can know what I have been through in these past few days.” He continued, “But to realize that six human beings, all of them my patients, one of them my best friend, are dead because they took medicine that I prescribed for them innocently, and to realize that the medicine that I have used for years in such cases suddenly had become a deadly poison in its newest and most modern form, as recommended by a great and reputable pharmaceutical firm in Tennessee; well, that realization has given me such days and nights of mental and spiritual agony as I did not believe a human being could undergo and survive. I have spent hours on my knees, once I had done all any physician could do for his patients. I have known many hours when death for me would be a welcome relief from this agony. On Monday it was announced that nearly all of the bottles of the elixir had been collected. The death toll now stood at 41 nationwide and continued to rise. While the medicine was now out of the hands of the public, patients were still suffering the consequences of its consumption. In addition, doctors were now going back and examining the records of the deceased to determine who else may have died from it. What’s interesting was that as many as 75% of those that consumed the elixir didn’t die from its consumption. Some made a total recovery, others stopped taking it once they noticed that it didn’t agree with their systems, and, even more surprisingly, was that many suffered no side effects after completing a full course of the medication. I can keep boring you with day-to-day updates, so I will just jump to the end of this entire mess. 240 gallons (approximately 908 liters) of the elixir had been manufactured and 95% was returned to Massengill or seized by the FDA. 399 people had been exposed to the elixir, causing 105 confirmed or probable deaths in 14 states. Mississippi suffered the greatest loss with 25 deaths, followed by Georgia with 13. According to my count, 37 of the victims were under the age of 18. The youngest was 6-months old and the oldest was 77-years of age. 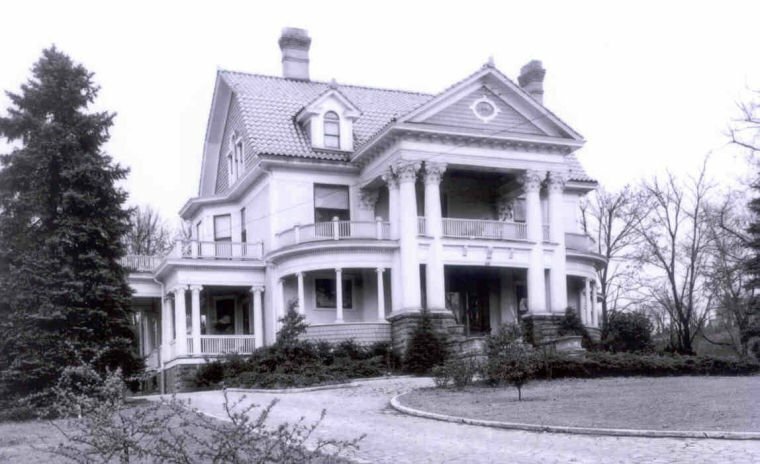 The mansion at 920 Holston Avenue in Bristol, Tennessee that Samuel Massengill lived in. The building still stands and was recently renovated. 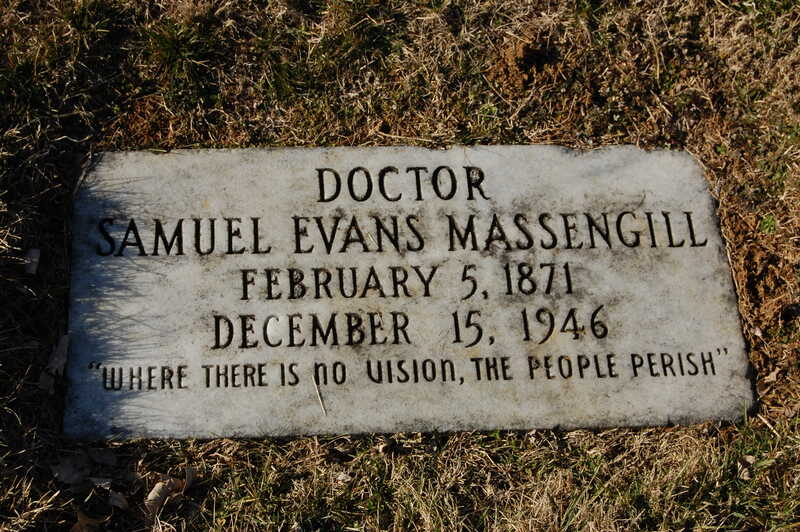 Samuel Evans Massengill, founder and president of the company was arrested on June 13, 1938 charged with 259 violations of the 1906 Food and Drugs Act. All were related to the interstate shipment of a misbranded and adulterated elixir. If found guilty, Massengill faced a maximum sentence of 261 years in prison and a fine of $261,000 (approximately $4.5 million today.) He posted $25,000 bail and was immediately released. On October 3rd, Massengill agreed to plead guilty to 112 of the counts in Greeneville, Tennessee. This was followed by a similar plea to 62 counts in Kansas City. He was fined $150 for each violation or $26,100 in total (about $450,000 today). He served no jail time. For a man worth an estimated $11 million in 1937, the penalty was fairly insignificant. One would think that lawsuits against the company would have bankrupted it, but that was not the case. Only six of all of the deaths resulted in a civil suit. It is unknown how many cases were settled before they ever reached the courtroom, but it is believed that all of the settlements were for between $300 and $3,000 (between $5,200 and $52,000 today.) The S.E. Massengill Co. did experience a decline in sales during the year of the sulfanilamide fiasco, the company still managed to squeak out a modest profit. 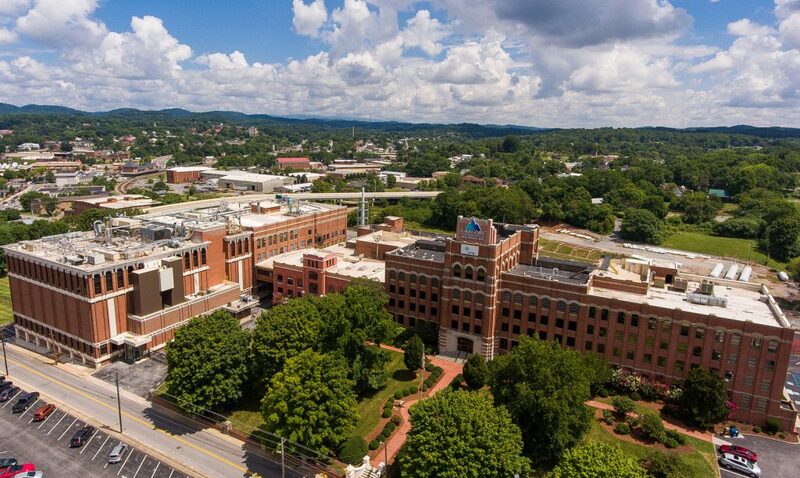 The old Massegill facility in Bristol, TN is now the home of UPM Pharmaceuticals, Inc. While Massengill’s chief chemist Harold Cole Watkins – the man who formulated the toxic elixir – was never charged with any crime, he apparently was unable to live with the guilt of what had happened. He was found dead at age 58 in his kitchen on January 17, 1939. Watkins had shot himself in the heart with a .38-caliber automatic pistol. Congress had been debating for years as to the pros and cons of creating stricter pharmaceutical laws, but took no action. Even President Franklin Roosevelt was ambivalent to changing the laws. The shocking number of deaths from the elixir finally forced them to take action. On June 15, 1938, both houses of Congress approved legislation that required manufacturers to thoroughly test and prove that their drugs are safe before they are released to the public. The FDA finally had the teeth that it needed to prevent something like the elixir sulfanilamide poisoning from ever happening again. Many credit this legislation with giving Dr. Frances Oldham, during her first month at the FDA, the power to keep thalidomide off the market in the United States, avoiding the medical tragedy that occurred in Europe during the early 1960’s. As hard as it is to believe, diethylene glycol tainted products continue to cause problems because it is a cheap substitute for safe pharmaceutical solvents. In the 1990’s hundreds of children lost their lives in Nigeria, Bangladesh, Argentina, and Haiti due to its use in over-the-counter medications. While no one was injured, millions of tubes of diethylene glycol adulterated toothpaste were distributed worldwide in 2007. When 75-year-old Massengill died on December 15, 1946, his company still marketed 939 pharmaceutical products, but that number quickly dropped off. By the time the late 1960’s the company was almost solely focused on its successful line of feminine hygiene products. Massengill was sold to Beecham in 1971 for $54.5 million. Today it is a division of Prestige Brands, the makers of Chloraseptic, Dramamine, Murine, Efferdent, and many other household brands that you know so well.